After watching Anton Corbijn’s The American, my interest in delving into Antonioni’s work grew – after all, there are plenty of thematic and stylistic similarities between The American and the other Antonioni I saw, Blow Up. But like Blow Up, Red Desert comes up a bit short in terms of meeting my expectations, particularly when I’m using Corbijn’s film as a marker. What Red Desert does have going for it is its sense of grandiose alienation and a performance grounded by the superb Monica Vitti. As Giuliana, Vitti towers over the richly detailed atmosphere. Her performance bares an eerie similarity to Gena Rowlands in A Woman Under the Influence – both play despairing wives with an undisclosed medical ailment, both vying for position in an increasingly dehumanizing world. Vitti tones it down though, instead aiming for something less transparent as Antonioni develops an atmosphere of ecological dread and blistering alienation. 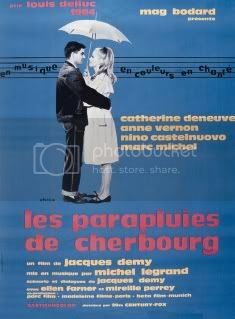 And what an atmosphere – if Corbijn has one fault in his attempt to mimic Antonioni, it’s that even his impressive visual sense lacks Antonioni’s consistency. Red Desert’s opening sees Giuliana’s husband, an electrical engineer, touring a factory. The sheer scope of the scenery, both in-doors and out is impressive – not just for its rich texture, but for its symbolic resonance that echoes throughout the picture. We see a green fog overtake the surroundings of the factory. As Giuliana distances herself from her husband’s work, she finds the streets near the Ravenna factory to be colorless and bland – her green coat often being the only source of vibrancy in a particular frame. The sounds of the factory seem to follow characters wherever they go, even as they attempt to escape Red Desert’s universe of overt subordination. 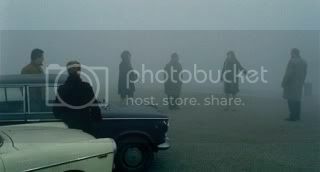 Vitti and her husband join a sexually promiscuous party in a scene that one can assume to be pulsating, is overshadowed by the foreboding sound of fog horns and the increasingly thick level of smog daring to consume Red Desert’s characters. Despite my admiration for the craft of the film, Red Desert falters in its sense of pacing. Blow Up was similar – I hate to be the kind of person to claim a film is too slow, but Antonioni’s deliberate pacing makes it hard to embrace his films on an emotional level. There’s an interesting overhead shot in Corbijn’s The American, where George Clooney drives through a constantly swerving stretch of road. The shot holds until Clooney makes it to the half way point in the road and cuts. I’ve read suggestions that had Antonioni directed that same scene, he would have held the shot all the way through, up until Clooney’s vehicle was outside of the frame. 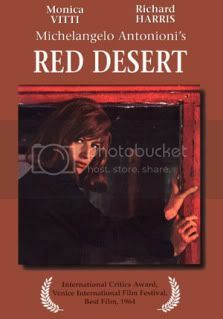 Red Desert is the sort of film that embraces that logic – Antonioni holds things for too long, overstaying his welcome by prolonging an effect that reached its apex midway through a frame.